Community Life and Outreach coordinates our parish resources, extending our Catholic faith to improve the quality of life for our neighbors. If you would like more information on volunteering, please phone our office at 336-272-4681, x104. An annual project during Advent that provides Christmas gifts to approved community agencies. In addition to the gifts, volunteers are needed to write gift tags, set up the gift trees in our church, sort the gifts, deliver and shop. An annual event that raises awareness and money for local, national and international services for the poor and hungry. 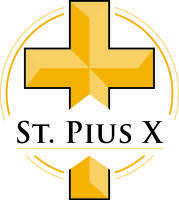 Saint Pius X consistently has many walkers and is one of the top money-raisers in Greensboro. Planning starts in late summer and the walk takes place in the fall. An annual fund-raiser for Triad Health Project, which provides support services to individuals and families living with and affected by HIV/AIDS. Our support promotes our belief that all life is a gift from God. Volunteers prepare and serve a meal at the church inviting members of the parish and their guests. The meal is free and donations are requested. This event takes place in the spring. Help Greensboro Urban Ministry Food Pantry – buy and place items in our food cart, located in the baptistry of our church. Each month, needed items are listed in the bulletin. There are also special food collections and food sorting that may take place during the spring and fall. Hall Towers is located near the parish campus and serves as affordable housing designed for older adults. Volunteers are needed to assist social activities and to pack Christmas care packages. This semi-annual food collection serves clients of Greensboro Urban Ministry. Volunteers collect food from shoppers twice a year at a nearby grocery store during a two-hour shift. This is an opportunity for families to volunteer together. Collections take place in April and October. During Thanksgiving, many families in our community need help providing food at their table for their children. St Pius collects and delivers food baskets (or bags) during Thanksgiving and sometimes other holidays. "Behind the scenes" volunteers are needed to help plan the logistics of food donation and delivery, map the deliveries and pick up the food on the day of distribution. If you have project planning experience or a passion to help others, your skill and time are desired. Communication of social justice and concerns for peace in our community, addressing issues such as the death penalty, racism, hunger, poverty and abortion healing and reconciliation. Teams of Drivers and Navigators deliver meals to homebound and/or elderly individuals serviced by Senior Resources of Guilford on the first Monday of each month. Package and sort food that will be delivered to Guilford County School students who do not have enough to eat at the Out of the Garden Project Warehouse, 300 NC 68, on the last Wednesday evening of every month, 6:00-8:00 pm and special times during Advent and Lent. To sign up, visit HERE. Sign-up here to help feed an evening meal at Pathways Center to families experiencing homelessness. Visit HERE. This group meets monthly to knit and crochet purple hats that are given to parents of newborns as part of an educational program for new parents teaching the prevention of Shaken Baby Syndrome. The hats are then delivered to the hospital or crisis pregnancy centers. Learn how to knit and crochet at the group or you can knit and crochet on your own. This group promotes the respect and dignity of human life from conception until natural death and participates in prayer events held in our church, provides resources to pregnancy centers and Catholic Charities, and provides educational opportunities regarding life issues such as adoption, abstinence, natural family planning, healing, and end of life issues. If you would like to help host a baby shower held at Room at the Inn, please go to the sign-up located HERE. There are more opportunities to volunteer at Room at the Inn and are available by calling 336 275-0206. A Great Way to “Ring In” the Christmas Season and the most recognized symbol of the Salvation Army. All the money stays in our community and helps a wide range of needs from the Center of Hope Shelter to Boys & Girls Clubs to Christmas giving programs for those less fortunate. Any St. Pius X member, family or group is welcome to volunteer to ring the bell in a 1-2 hour shift. Our parish volunteers provide transportation on the 3rd Friday of every month to medical appointments for senior adults who are unable to drive. This program is sponsored by Senior Resources of Guilford County. There are many drivers and appointments so you can drive as little or as much as your time allows. Located in downtown Greensboro, Step Up Greensboro offers monthly classes for people who are ready to make positive changes and become self-sufficient through employment. Jobs readiness mentors are needed to write resumes and lead mock interviews. This ministry is on-going and volunteers are welcome to join any time. Opportunities are flexible and training is available through Step Up. Call the parish office if you would like to attend a Lunch and Learn at Step Up Greensboro. St Pius provides dinner, social and recreational activities for intellectually and developmentally disabled adults in Guilford County on the first Friday evening of the month. Activities include karaoke, bingo, pot lucks and dances are offered here on our campus. This is a great volunteer activity for families and donations of dinner food are also needed. More information, including food sign-up is HERE. As a tithing parish, we share our resources. This committee, appointed by the Parish Council, determines how our resources will be shared with organizations and groups who serve those in need. Any adult may express interest in being appointed. The time commitment is 2-4 hours per month.